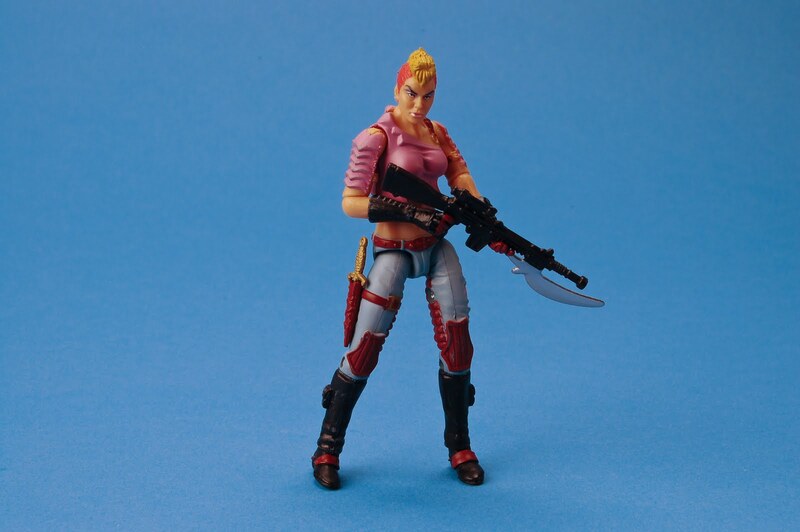 Zarana was released in the summer of 2011 as a convention exclusive at San Diego Comic-Con. 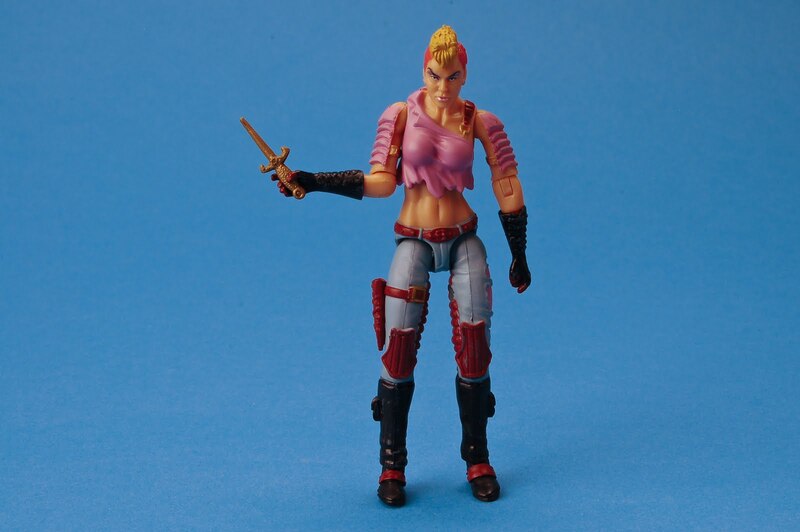 Two versions of Zarana were produced: a primary deco version matching the classic style of the original 1986 figure and a variant version with dark paint applications and t-shirt sporting the logo of Dreadnok rock band Cold Slither. 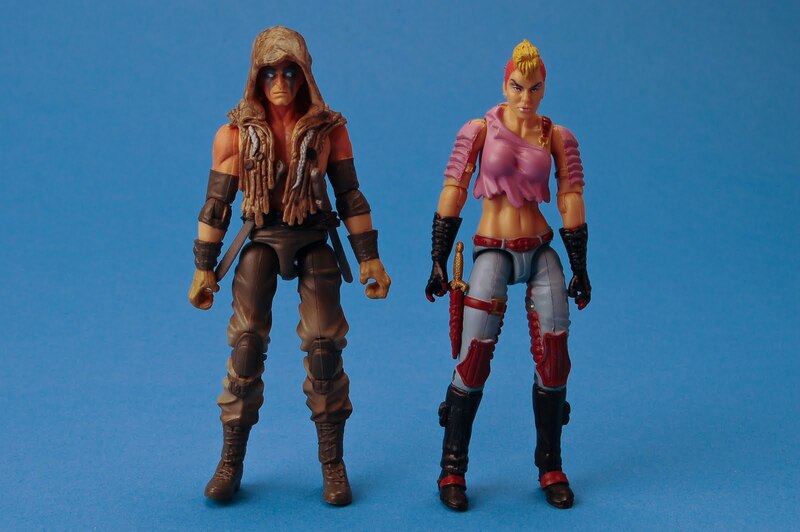 Both figures were available at the Hasbro Toy Shop booth (limited to three for the primary version and one for the variant, per attendee badge) at Comic-Con and later online at HasbroToyShop.com, in limited quantities. 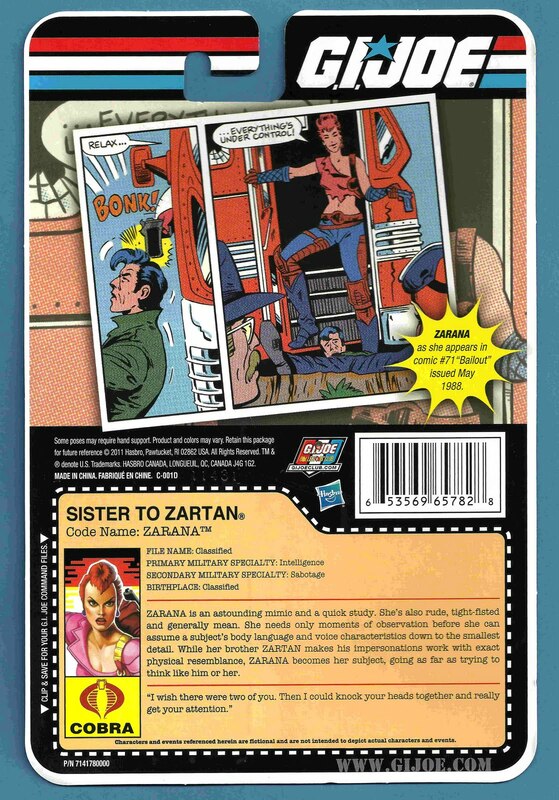 Like the original 1986 card art, the artwork for this modern update to Zarana features a digital explosion art pattern behind the character portrait. 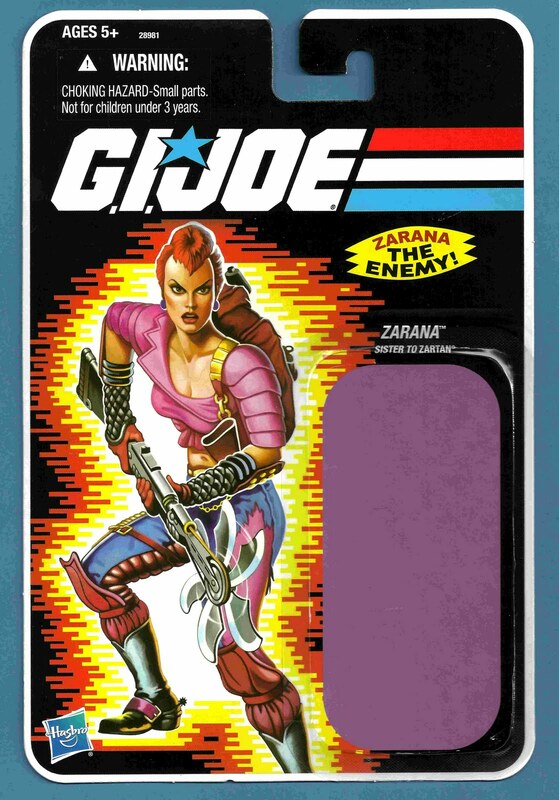 This digital pattern was introduced with series five figures in 1986 and carried forward until 1992, however, card art for figures from this era in the G.I. Joe 25th Anniversary line did not have this digital pattern and instead used the traditional explosion pattern. Did You Know? 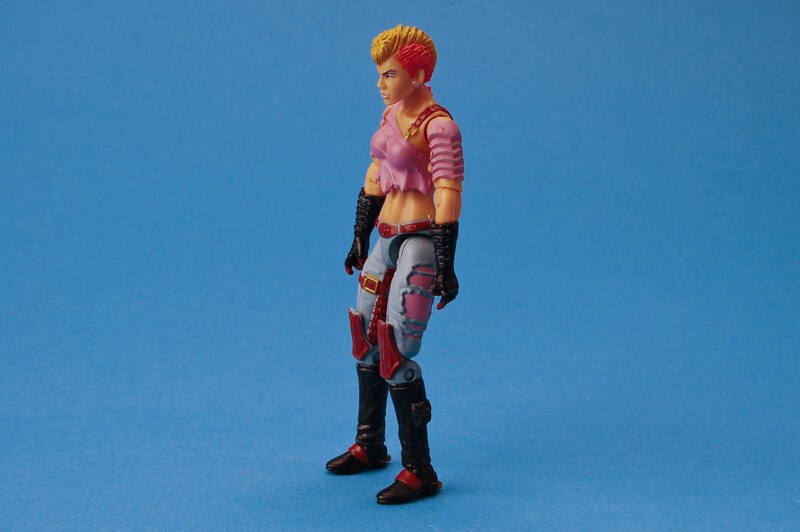 The 1986 version of Zarana had a running change with variations commonly referred to as with earrings or without earrings. 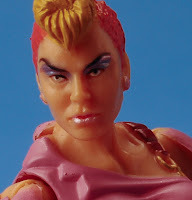 The figure's initial run was made using a larger head with earrings, while subsequent runs had a smaller, more feminine, head without earrings. 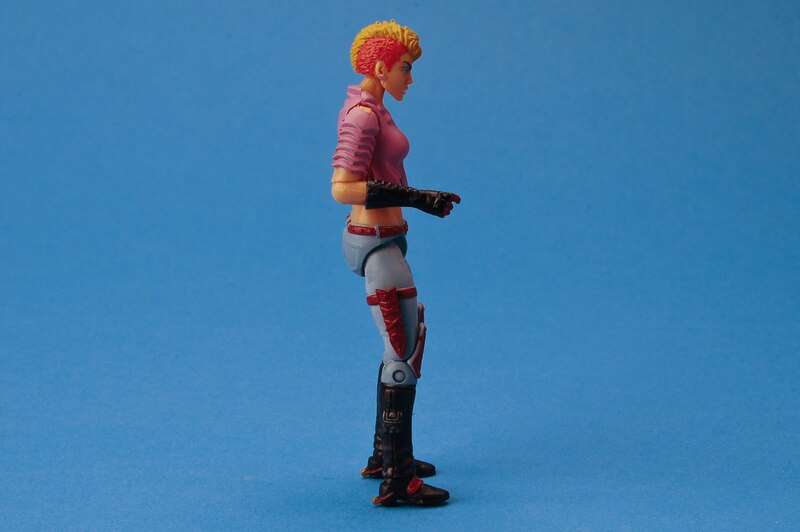 Both the primary and variant Cold Slither Comic-Con exclusive versions of Zarana have earrings. 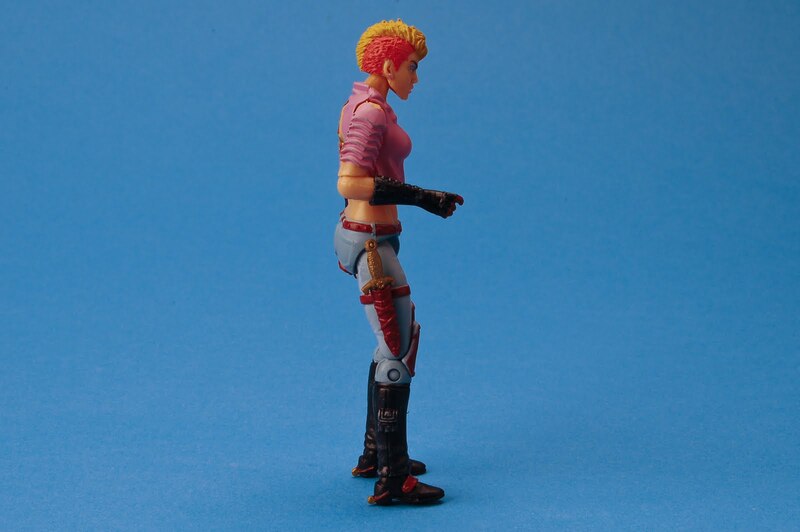 Zarana is an astounding mimic and a quick study. 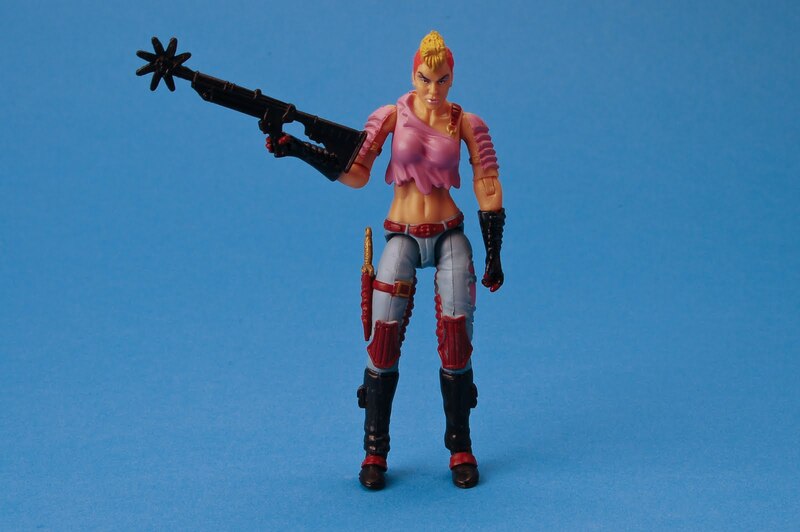 She's also rude, tight-fisted and generally mean. She needs only moments of observation before she can assume a subject's body language and voice characteristics down to the smallest detail. 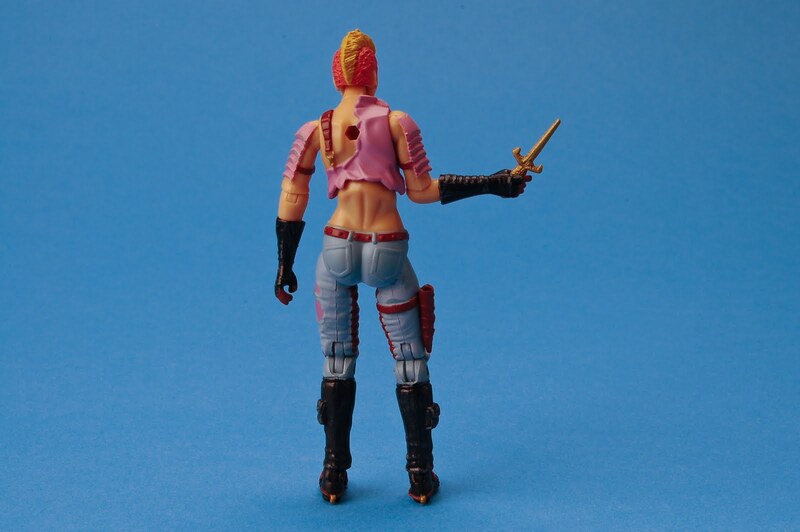 While her brother Zartan makes his impersonations work with exact physical resemblance, Zarana becomes her subject, going as far as trying to think like him or her. "I wish there were two of you. Then I could knock your heads together and really get your attention." 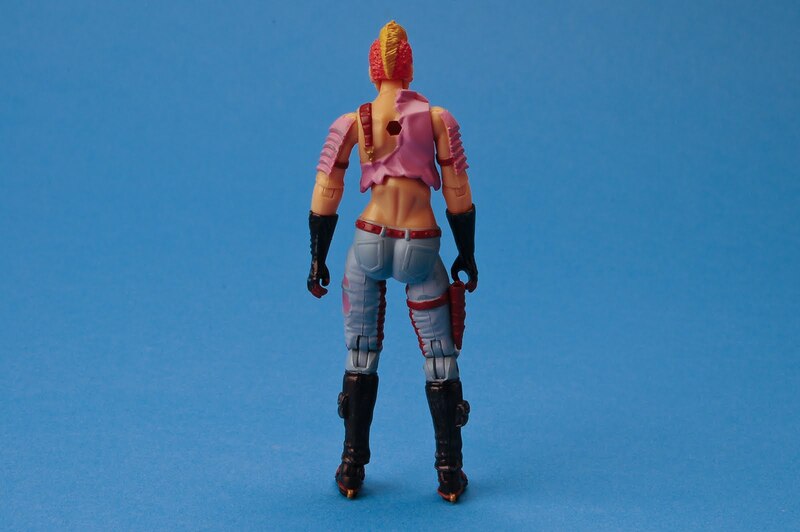 I really don't care what the fans that says that SDCC figures should only be available in SDCC only, most of those are not collectors but scalpers. 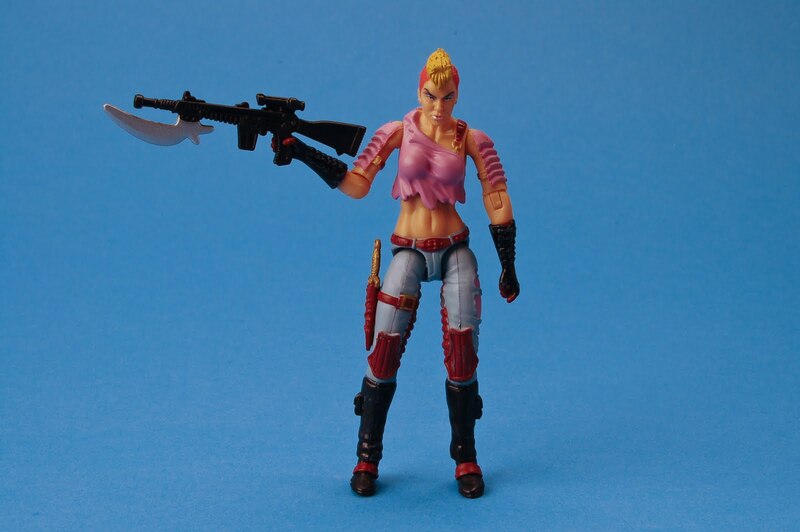 I think Hasbro really dropped the ball on this one, last year they have an excuse, that they have to pay a certain amount for the rights to make a certain amount of Slaughter figures. This year they don't have that excuse. What gives? Is it because they still have a lot of pimp diddy Destro hanging around? 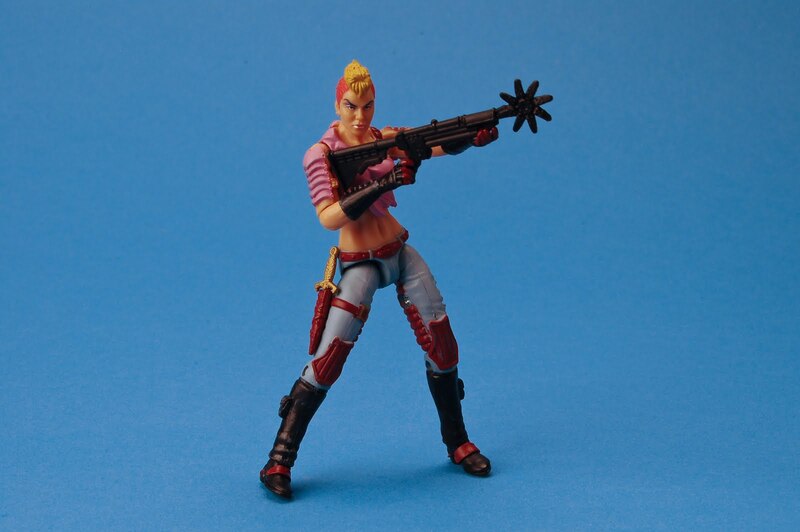 I love this figure but I am not about to burn $100+ plus dollars for 2 figures. 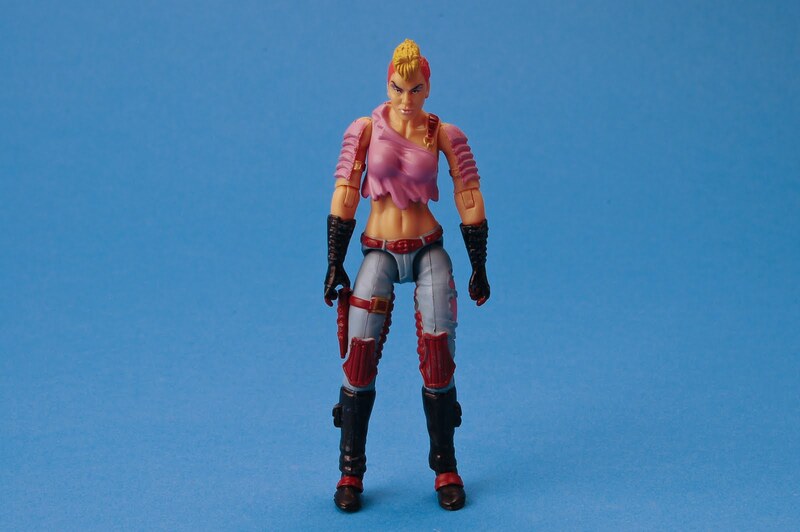 Maybe this will send a strong message to Hasbro that it is not because your figure is a female why it is not selling well, it is because it was not made well. 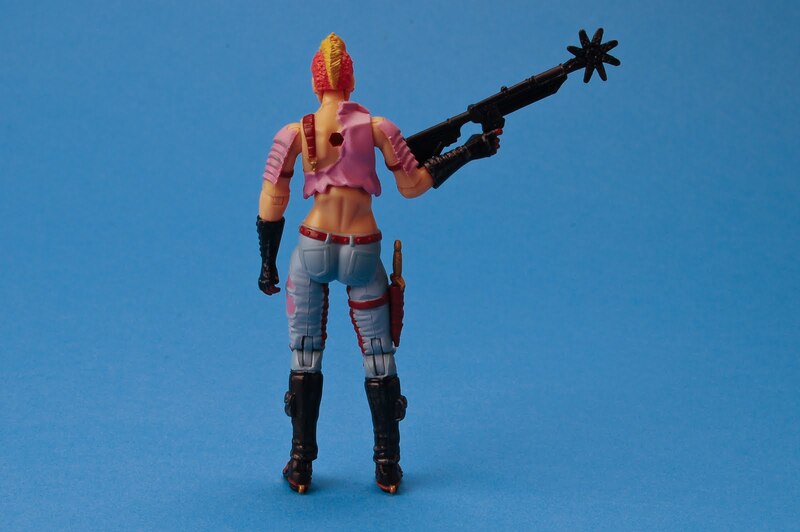 Hasbro tried to ensure collectors were able to get this figure by not allowing attendees with a dealer badge into the line, for a few hours, on preview night. 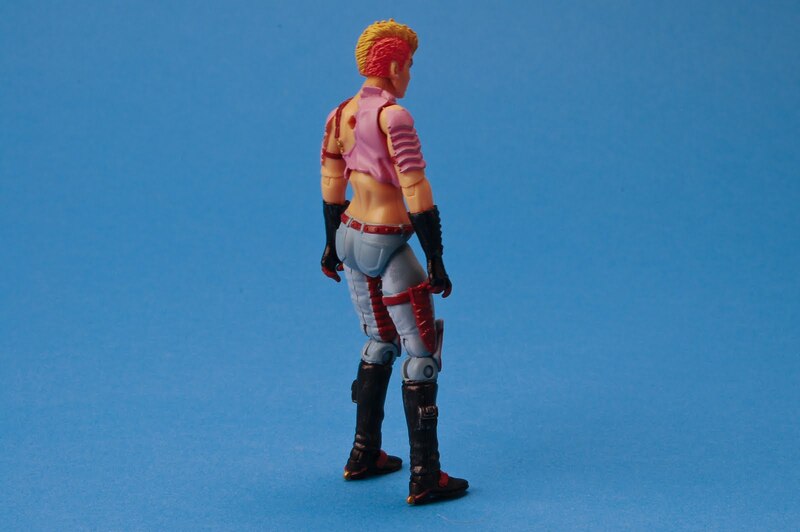 Quite honestly we weren’t as disappointed with the handling of this as we were with the Dial Tone figure by the G.I. Joe Fan Club at G.I. Joe Con, this year. There were dealers blatantly selling more than their allotted maximum of Dial Tone for $150 and people (lots of them) who were true fans missed out. It’s sad that businesses resort to what essentially resorts to extortion for these figures because of their perceived value. It’s for this reason we do not and will not solicit advertising from any business not selling these items at their suggested retail price. 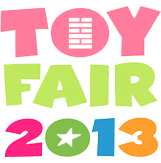 We agree that Hasbro is not handling exclusives in a fan-friendly fashion and should employ a pre-order and after show sale model that is more in line with Mattel. 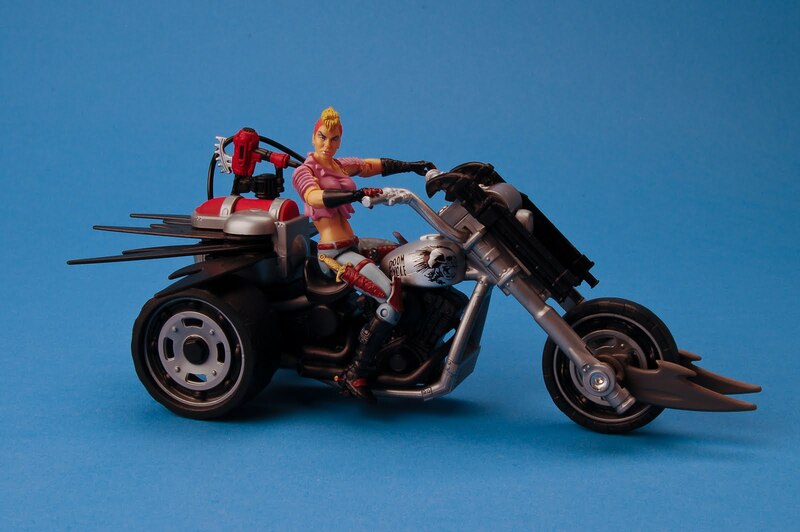 You don’t hear many complaints from fans about not being able to secure a Mattel exclusive because Mattel has a good sales model in place that ensures wider availability. If you are able to secure one of these for a reasonable price, I’d highly recommend this classic-style version. 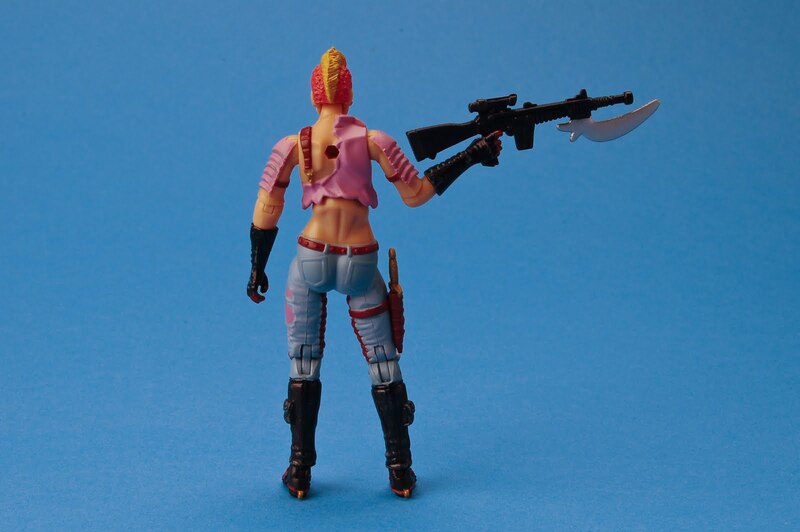 Although the stance of the body is a little awkward, the figure has impressive paint apps and looks great displayed alongside the rest of the Dreadnoks.